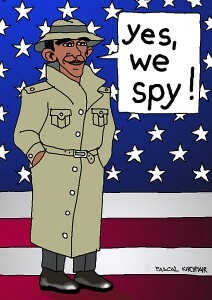 Is it okay for Barack Obama to spy on reporters? Is it okay for government spooks to record their calls, monitor their online activity and collect their emails whenever they want? Well, according to a shocking new poll conducted by Pew Research, 64 percent of investigative journalists believe that the government is already collecting data from them right now. Sadly, very few of them are publicly voicing objections. We are rapidly becoming the type of “Big Brother” society that George Orwell once wrote about, and most Americans are just going along for the ride. One journalist that is making waves is former CBS News reporter Sharyl Attkisson. In her new book entitled Stonewalled: My Fight for Truth Against the Forces of Obstruction, Intimidation, and Harassment in Obama’s Washington, she claims that she has evidence that the government remotely activated her computer numerous times, monitored her keystrokes and even buried incriminating documents very deeply on her hard drive. She has filed a lawsuit, and hopefully this will result in the public shaming of those involved in this spying. With each passing day, we are becoming a little bit more like Nazi Germany, and if we continue down this road America will eventually be completely transformed into a totalitarian hellhole. Have we really gotten to the point where virtually everyone knows that the government is spying on them but we just accept it as a fact of life? How in the world can we have “freedom of the press” if the government is constantly looking over the shoulders of journalists? In a survey of investigative reporters that makes Richard Nixon’s enemies list look like child’s play, nearly seven in 10 said they believe that the Obama administration has spied on their phone calls, emails and online searches. According to a Pew Research Center survey of 454 media figures, 64 percent “believe that the U.S. government has probably collected data” from their calls and email and eight in 10 believe just being a journalist jumps the chance Uncle Sam is spying on them. The survey follows multiple reports of actual spying by federal officials on reporters, and the White House’s effort to track down those who leak information to reporters despite long-forgotten promises to be the most transparent administration ever. As a nation, are we going to put up with this kind of thing? Or could it be that we are already so whipped into submission that we are incapable of even objecting to Big Brother? Our control freak politicians wish to monitor and control every area of our lives. One of the latest areas where there is a renewed push for control is vaccines. A recent outbreak of measles has lawmakers all over the nation in a rush to make vaccinations mandatory. Responding to an outbreak of measles that has infected more than 100 people, two California lawmakers said on Wednesday they would introduce legislation to end the right of parents in the state to exempt their children from school vaccinations based on personal beliefs. 1. Since 2005 (and even before that), there have been no deaths in the U.S. from measles, but there have been 86 deaths from MMR vaccine – 68 of them in children under 3 years old. And there were nearly 2,000 disabled. 5. In 1982 William Torch, a prolific researcher and publisher on Neurologic topics, presented a paper (later published) at the American Academy of Neurology reviewing SIDS deaths. He reported that in 100 consecutive cases, 70 percent of SIDS deaths occurred within three weeks of pertussis vaccination. Over the years, countless numbers of children have been killed or permanently disabled by vaccines. At this point, more than 3 billion dollars has been paid out to the victims. But you never hear about any of this on CNN or MSNBC, do you? If you think the government has the right to forcibly vaccinate people – for the good of society – what is to prevent them from forcibly sterilizing people, or forcibly euthanizing people, or forcibly implanting a tracking device – for the good of society? If you think that forcible sterilization would never happen, you are wrong. A mother of six with an IQ of 70 should be sterilised for her own safety, the Court of Protection has ruled. The Court heard that a further pregnancy would be a “significantly life-threatening event” for both the mother and child. Mr Justice Cobb said the woman had the “same human rights” as everyone else and this was not a case of “eugenics”. He has authorised health and council services to intervene and perform the sterilisation. This is where our society is heading. We are becoming a society where the government is god, and where all of our life decisions are made for us by control freaks that believe that they know better than everyone else. Unfortunately, we are so addicted to the things that are entertaining us that most of us never even bother to notice what is happening to our society. I found the following news story earlier today, and I thought that it was a great metaphor for what is happening to us as a nation. The mother of three young children found abandoned and locked inside a Washington home has admitted to using meth and told the court she is pregnant with a fifth child. Amanda Foley and Mark Dorson, both 33, were arrested this week after their children were found on Saturday alone locked in a filthy run-down Lake Stevens house, starving and shivering in 40-degree temperatures. The children, aged seven, three, and 11 months, were living ‘among animal feces and human excrement’, according to court documents. Just like that young mother, we are so addicted to entertainment that we can’t even see what is happening to the future of this country. Most of us would live in our own filth until it piled up to the ceiling as long as we were being entertained. Meanwhile, everything that this country is supposed to stand for is being destroyed.